Sets record as Fastest in Industry to achieve 40th million mark in just 18 years! New Delhi, December 20, 2018: Creating history in the Indian two-wheeler industry, Honda Motorcycle & Scooter India Pvt. Ltd. today announced the accomplishment of 40 million cumulative two-wheeler sales. With this, Honda is now the ONLY two-wheeler brand in India to cross the 40 million units’ mark in the shortest time span of just 18 years. Honda gained its first 10 million customers in the initial 11 years. Growing 3 times this speed, the next 10 million customers were added in just next 3 years. While the first 20 million customers were added in 14 years, Honda led India’s accelerated growth for mobility on two wheels and added the latest 20 million customers in just 4 years. 2001 -2011: Honda’s maiden product – the iconic Activa established Honda’s legacy in scooter segment. Fast scaled up production and stepped into the motorcycle segment with premium 150cc CB Unicorn and 125cc CB Shine (now India’s largest selling 125cc motorcycle). Introduced Industry First feature - Combi-Brake System with Equalizer technology in 2009 that would go on to become mandatory a decade later. 2011- 2018: In 2011, HMSI entered a new era as only Honda in the Indian two-wheeler industry. In these short 7 years, Honda parallel created many new benchmarks in the industry too. From expanding production from 16 lac units annually at 1 plant to 64 lac units annually from 4 plants, from its entry into the mass motorcycle segment in 2012 with Dream Yuga to the new Technical Center for faster development of India specific models, from starting the Make In India for big bikes in 2015 with CBR 650F and later Africa Twin to bringing new type of ride for India with NAVI and India’s first utilitarian scooter CLIQ, from Activa overtaking all two-wheelers to become India’s highest selling two-wheeler to CB Shine motorcycle breaching the 70 lac sales mark. Infact, Honda 2Wheelers India’s rapid growth has propelled it to becoming the No. 1 contributor to Honda’s global two-wheeler operations across 120 countries. But this is not all. In pipeline is yet another 6 lac capacity addition which will take Honda 2Wheelers India’s total capacity to 70 lac units annually by 2020. - First Make in India big bike CBR 650F launched. 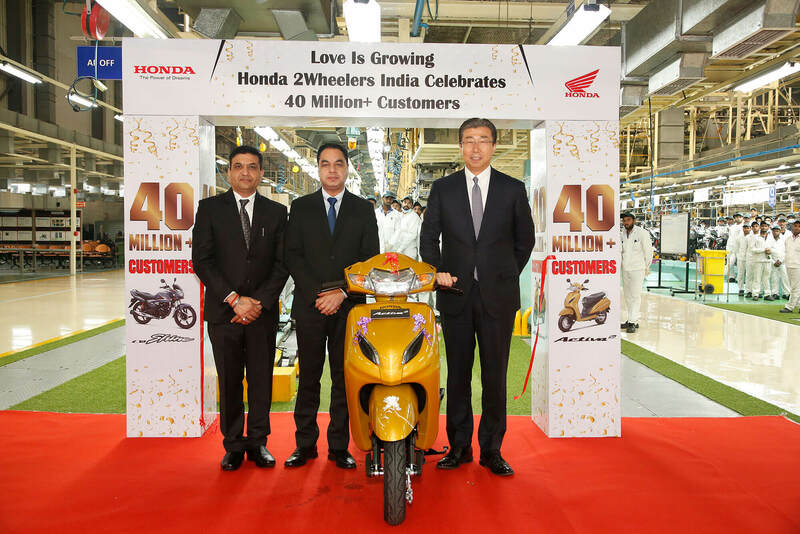 -Honda launches its biggest and 100% digital customer loyalty program ‘Honda Joy Club’ – a two-wheeler industry first!